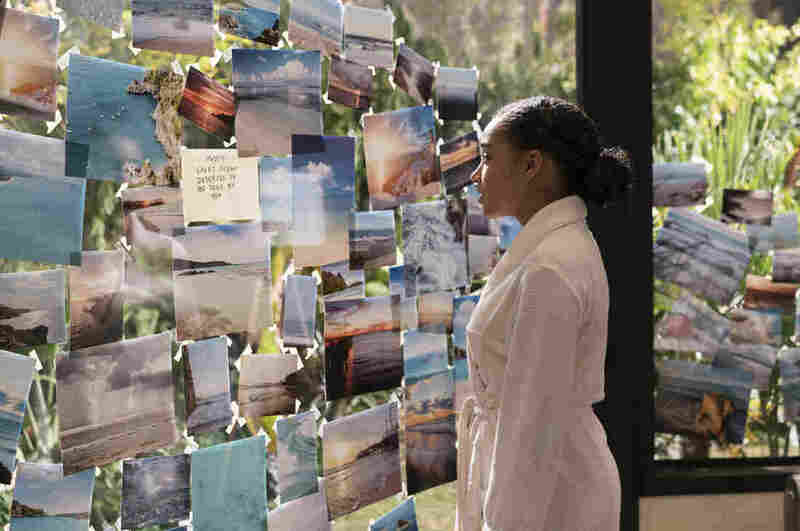 'Everything, Everything': Amandla Stenberg 'Infiltrates' Teen Romance World Amandla Stenberg stars in Everything, Everything as teenage girl who is forbidden to leave her home due to a rare illness. Stenberg talks about this role and her activism with NPR's Mary Louise Kelly. Doane Gregory/Courtesy of Warner Bros.
Amandla Stenberg stars in Everything, Everything, a complicated love story between a teenaged girl unable to leave her home because of a rare illness, and her new next-door neighbor. You may recognize her for her role as Rue in the movie, The Hunger Games. It was in this fan favorite that Amandla Stenberg made her mark as the smart sidekick to Katniss Everdeen, played by Jennifer Lawrence. But away from dystopian world of The Hunger Games, the teenager has also been making her mark on the Internet. Stenberg's sharp commentary on race and culture on social media has earned her millions of fans, as well as controversy. In 2015, as part of a school project, Stenberg and a classmate uploaded the video "Don't Cash Crop My Cornrows." The viral video catapulted her career in activism for which she amassed awards, made appearances with Beyoncé and landed on magazine covers, even being named by Teen Vogue "the new face of Feminism." Now the 18-year-old is playing the lead in three films out in 2017, including the teenage love story Everything, Everything — based on the best-selling novel by Nicola Yoon. Stenberg plays the smart, whimsical Madeline "Maddy" Whittier. Due to a rare disease that weakens her immune system, Maddy is forced to live her life inside a sterilized house. One foot outside the hermetically-sealed home could mean certain death. But everything changes when she meets the son of the new neighbors next door. When Stenberg first learned about the role, she knew she had to take it. "Honestly, I don't know if I ever have seen a movie like this with a black girl in the lead," she tells NPR's Mary Louise Kelly. It definitely got a little bit claustrophobic at times but it was cool because it allowed us to really explore all the feelings within that space. I think Maddy's relationship with her mother is something we never get to see. There's a lot of relentless love and in many ways a lot of things that are somewhat abusive because you learn — I won't reveal anything — there's a large twist that you'll have to learn for yourself when you see the movie. This movie is not about race, there's never a conversation in the film. What it does is it just shows us existing. I'm constantly trying to re-evaluate how best to utilize my voice... When I put out that Youtube video about cornrows [it] was a moment when social media was the most integral to having these sorts of conversations. Social media in general is really saturated with dialogue, and saturated with these conversations. I think that's important and good and necessary. But I don't know if my contributing to more dialogue when I've already said things that I wanted to say would necessarily be that productive in social activism and creating change. And so I think I can be more productive by doing things like Everything, Everything, which is something that a couple of years ago maybe I wouldn't have done. But now I can see the power in — I like to use the word — infiltration. Infiltrating these larger corporations that would traditionally put out media that would just feature white people. I think it's only helped, and I think there's a reason for that. ... Teenagers nowadays are so wicked smart, I mean we've grown up with computers in our hands and we know when we are seeing something sold to us because we're used filtering ads, we're used to filtering through media constantly. I think that a lot of teenagers are getting really bored of the same stuff coming out, and they're getting bored of the same white people in roles, and they want diversity, especially black teenagers, of course. And I think that studios have had no other option than to respond to that. And because I've been someone who has had this direct connection to people my age — this direct connection to these teenagers who care about social activism — I'm the person that they're casting. Denise Guerra is a production assistant on NPR's Weekend All Things COnsidered.